I've had a lifelong fear of figs. I blame it on my Swedish grandmother who lovingly baked sweets that she wanted her precious only young grandaughter to try. Among these treats were cookies with fresh fig filling. Though I loved grandma and appreciated her spoiling me endlessly, I couldn't stand the texture of the fig cookies. Grandma was hurt. Whenever I didn't eat what she made, she was hurt. So I ate them anyways and pretended that I liked them. Yuck. And I haven't touched figs since... until yesterday. We have the good fortune of having a Farmer's Market near our house that is open every day (Chino Farms). It's one of those good ones too... where they grow all of their own food right there and put out whatever is ripe that day. I was there to pick up some of their famous Chino Corn when I spied a small basket of fresh figs. Hmmmm, I thought. Perhaps I'll give them a try. Mind you, it's been a good 30 years since I've had figs. So I carted home my basket of freshly picked figs and browsed cookbooks. 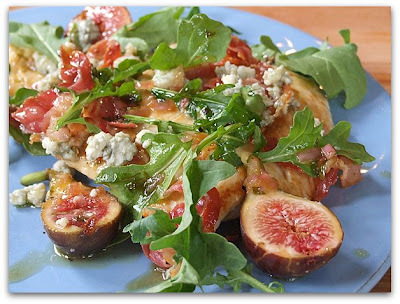 Tyler's Ultimate had a recipe that looked like a must-try: Chicken Paillard with Fresh Fig Salad and Blue Cheese. If you don't have this cookbook, it's really worth looking at. Tyler Florence is one of those chefs that I do enjoy watching on Food Network. He's a cutie, and he has some good looking recipes that are along the line of things-I'd-try. 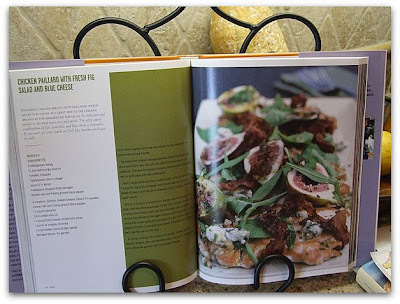 Tyler's Ultimate cookbook has loads of pictures (love that) and I think I'd make just about all of them. The recipe involved pounding out the breasts into paillards (thin slices), which I'm a big fan of. This allows the breasts cook quickly and stay moist. Pancetta is sauteed, then the chicken, and the dressing gets a quick warm-up in the pan. That's it! 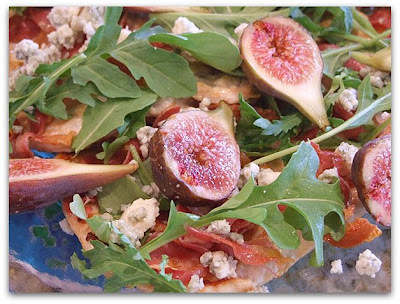 Assemble with chicken, blue cheese, arugula, figs and pancetta. The sweet vinaigrette is drizzled on top, and dinner is ready! And guess what? I loved it. I especially enjoyed the bites that involved figs. It's hard to believe that I've shunned them for so long. I would make this recipe again in a heartbeat. Though it sounds fancy, it's so simple and completely delicious. This RecipeGirl has turned fig phobia into fig obsession. Bring on the fig recipes! Just no fig cookies, please.